Today is yet another dark day in history during an era that seemingly knows no other kind of day. President Trump opened the new U.S. embassy in Jerusalem, declaring the world’s holiest city (per three major religions) to solely belong to Israel. Israel occupied East Jerusalem during the 1967 Six-Day War, and according to the 1993 Israel-Palestinian peace accords, the final status of Jerusalem is reserved to be discussed in the latter stages of peace talks. It’s difficult to see this now under the proto-Trump White House that is the Netanyahu administration, but Israel’s default position once was: Jerusalem is up for negotiation. Now, Gaza and the Golan Heights—two areas illegally occupied by Israel—aren’t even up for negotiation. The Israeli Defense Forces (IDF) dropped leaflets in Gaza prior to the ceremony—warning Palestinians against protesting—but thousands still showed up at the border this morning. The IDF wants us to believe that everyone who showed up was a member of the Iranian-backed militia, Hamas. Anna Ahronheim, Military Correspondent for the Jerusalem Post, provided updates throughout the morning as the conflict intensified. 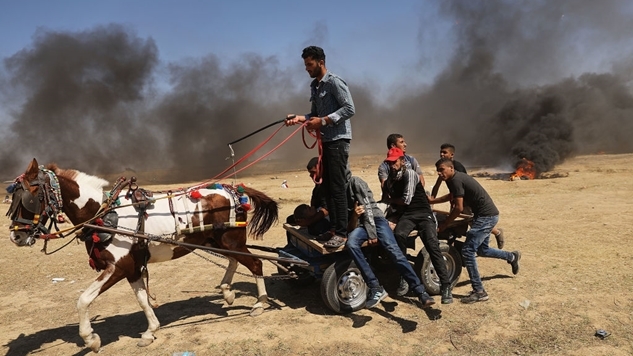 #Hamas-run Health Ministry in #Gaza say 18 #Palestinians killed by #IDF fire, including a 14 year-old teen. #Israel's military confirms IAF struck Hamas outpost near Jabaliya after identifying it as a source of gunfire towards troops. As always, whenever the IDF kills Palestinians at the border, a dispute over their humanity arises. The IDF claims that these are Hamas forces trying to enter Israel to compromise its security, but as the video last month of an Israeli sniper cheering after shooting a Palestinian journalist demonstrates, this is a specious argument at best. Hamas and Hezbollah do embed themselves within the Palestinians. They are complicit in this crime against a subjugated people in the sense that they provide a nebulous bulls-eye for Israel to shoot at. They place strategic targets among the populace, then dare Israel to shoot. Under Netanyahu’s “leadership,” Israel has gleefully done so, destroying any moral high ground they claim to have on this topic. Even if their military’s assertion that Hezbollah has hundreds—if not thousands—of installations embedded within the Palestinian people is correct, it doesn’t excuse Israel from blindly shooting civilians in the hope that they’re on Iran’s payroll. This whole conflict is utterly depressing, especially for Jews like me who grew up with tales of our ancient people that now sound like what the Palestinians presently endure. It doesn’t help that major American media like the New York Times rarely attribute any malice to Israel—as this “dozens of Palestinians have died” headline demonstrates—which guarantees that casual news observers in the only country that can truly force Israel’s hand are ill-informed as to what’s actually happening. Palestine is stuck under the thumb of the United States—who treats Israel like a forward operating base in the Middle East—and Iran, who is more than happy to provide fuel to the Palestinians’ suffering by sprinkling Hezbollah units among a legitimate movement who simply wants a home to call their own, just like the one the world awarded to the Jews in 1948. With the poor excuse for “leadership” demonstrated not just today, but over the past few decades in Israel, the United States and Iran, this tragedy looks certain to endure until at least 2048.